Easy-peasy bars that taste really good and take just minutes to make. Dry ingredients: 2 cups old fashioned oats and 3 scoops of protein powder (30gr per scoop). Wet ingredients: 1/2 cup apple sauce,3 tbsp peanut butter, 1/2 tbsp chia seeds, 1 pack instant coffee of any flavor and about 20 drops of sweetLeaf stevia. Now mix dry and wet ingredients. Boom! Done! I melted 99%dark chocolate with 1 tsp of coconutoil and poured over the protein mixture that I pressed into a glass dish. While the chocate was still liquid I sprinkled the top with raw pumpkin seeds, goji berries and mulberries. Talk about superfoodsâ—Now its sitting in my fridge. Im gonna cut it into 5-6 bars and post later. 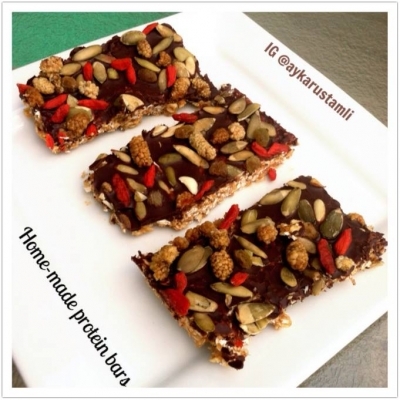 Get creative here and add any topping you like or use any protein powder of your favorite flavor. I have made these bars many time and they always turn out great.